How December 4th Could Trigger The "Most Violent Economic Shock In History"
It was the one moment that convinced Hitler suicide was better than surrendering. 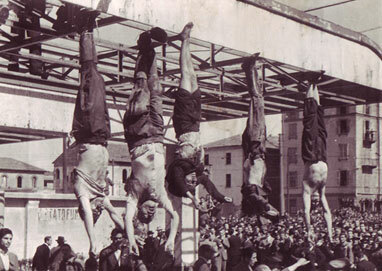 On the morning of April 29, 1945, the bodies of Italian dictator Benito Mussolini and his mistress were dumped like garbage into Milan’s Piazzale Loreto. A large mob of Italians quickly gathered. They pelted the former leader’s corpse with vegetables. They spat on it. They urinated on it. Some even emptied their pistols into his lifeless body. After a few hours, the crowd hung the bodies from a metal girder at a nearby gas station for all to see. I walked through Piazzale Loreto during a recent trip to Italy, which is suffering its worst economic downturn since 1945. And I realized that Italians are angrier now than they’ve been since they hung Il Duce up by his heels. That’s almost two decades of economic stagnation. By any measure, the Italian economy is in a deep depression. And things will probably get much worse. The Five Star Movement (M5S) is Italy’s new populist political party. It’s anti-globalist, anti-euro, and vehemently anti-establishment. It doesn’t neatly fall into the left–right political paradigm. M5S has become the most popular political party in Italy. It blames the country’s chronic lack of growth on the euro currency. A large plurality of Italians agrees. M5S has promised to hold a vote to leave the euro and reinstate Italy’s old currency, the lira, as soon as it’s in power. That could be very soon. Given the chance, Italians probably would vote to return to the lira. If that happens, it would awaken a monetary volcano. If the FT is even partially right, it means a stock market crash of historic proportions could be imminent. It could devastate anyone with a brokerage account. On December 4, Italian Prime Minister Matteo Renzi’s current pro-EU government is holding a referendum on changing Italy’s constitution. According to the latest polls, the “No” camp has 54% support and all of the momentum. Even prominent members of Renzi’s own party are defecting to the “No” side. One way or another, M5S will come to power. It’s just a matter of when. If Renzi’s December 4 referendum fails—and it looks like it will—M5S will likely take over within months. Once it’s in power, M5S will hold a referendum on leaving the euro and returning to the lira. Italians will likely vote to leave. Italy is the third-largest member of the Eurozone. If it leaves, it will have the psychological effect of yelling “Fire!” in a crowded theater. Other countries—notably France—will quickly head for the exit and return to their national currencies. Think of the euro as the economic glue holding the EU together. Without it, economic ties weaken, and the whole EU project unravels. The EU is the world’s largest economy. If it collapses, it would trigger an unprecedented global stock market crash. That’s how important Italy’s December 4 referendum is. It would be the first domino to fall. Almost no one else is talking about this. That’s why I just spent several weeks in Italy, taking the pulse of the country. Italy’s December 4 referendum could make or break your wealth this year. If it fails, the EU, which has the world’s largest economy, will likely fall apart… triggering an epic stock market crash.